I’ve been sleeping on an INTELLIbed for several years, and it is BY FAR the best bed on the market. Soft or Firm? Why not both! Many of our clients come in to see us and say, "I need a firm bed!" while many others say, "Not me! I need my bed soft." We've kind of been trained into thinking that's how we pick a bed: we pick a soft one, a firm one, or something in between. Most people are really surprised to learn that it's not actually about soft or firm that they're looking for in a bed. It's about support. Proper support, to be exact, and in the proper places, coupled with comfort in the right places. 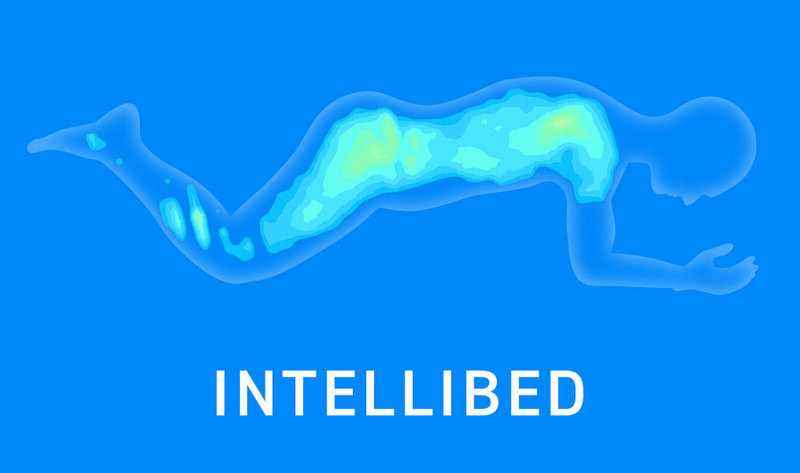 In an industry where most of the players are doing the same thing, INTELLIbed is breaking the mold... and solving sleep problems. The distinguishing feature of their mattresses? Their one-of-a-kind Gel Matrix™—a medical-grade cushioning technology designed for simultaneous support and comfort. Three times firmer than typical foam mattresses, it is also soft enough to relieve pressure points (like hips and shoulders) better than anything we've ever seen. Oh, and its main ingredient is food-grade mineral oil, which means a safe, entirely non-toxic sleep surface for you and your family members. INTELLIbed pours this special formula Gel Matrix into an optimized grid of hollow columns. These columns buckle under focused pressure, but they distribute and uphold weight spread over a larger surface area (a science they call Dynamically Adaptive Cushioning™). The result is a bed that responds to different parts of your body in different ways: supporting areas that need support for proper alignment, while softly giving way in areas that need comfort. Take a quick look at this video to see what we're talking about. 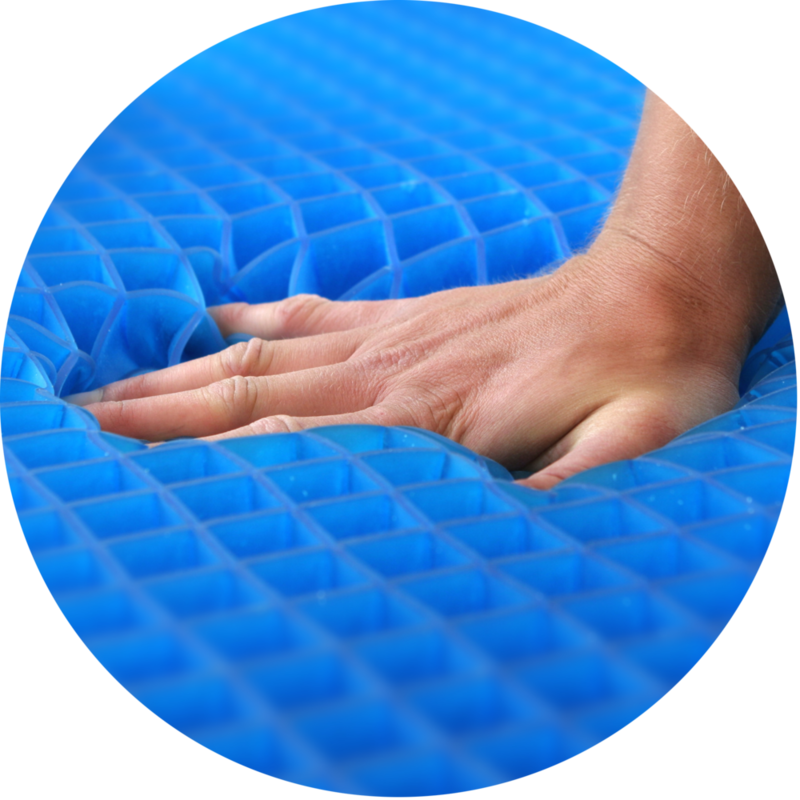 Take a look at how the INTELLIbed Gel Matrix matches up against other mattresses in pressure mapping tests. This stuff is the real deal! Alignment is crucial for good sleep. If you sleep unaligned, you wake up with a sore neck, hip, shoulders, or back. Equally important is pressure relief. 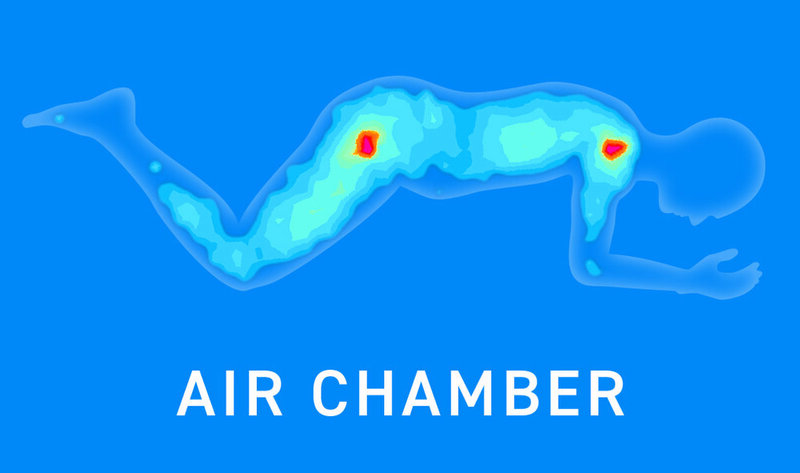 As you see in the scans, other mattresses can offer support, but still leave pressure points on your back, hips, and shoulders (the red spots). Pressure on these points means poor circulation and discomfort, which lead to you waking up, rolling over, and interrupting healthy sleep patterns. But take a look at the INTELLIbed scan. No red! With the technology of the INTELLIbed Gel Matrix, your body can get the proper alignment support AND comfortable relief of your pressure points. You wake up feeling good in your joints AND well rested from a night of deep, uninterrupted sleep. Then you owe it to yourself and to your loved ones to invest in a bed that can give you the kind of sleep you should be getting. Sleep is a supplement to the good life, an investment worth making. Sleep should feel luxurious, and that's why we offer the INTELLIbed Luxury Collection. When you curl up on one of these, you'll never want to get out of bed. Each model contains the sleep-changing INTELLIbed Gel Matrix technology, and each is backed by an incredible 20-year warranty. So how do you choose? Come in and try them out to discover which one feels best to you. 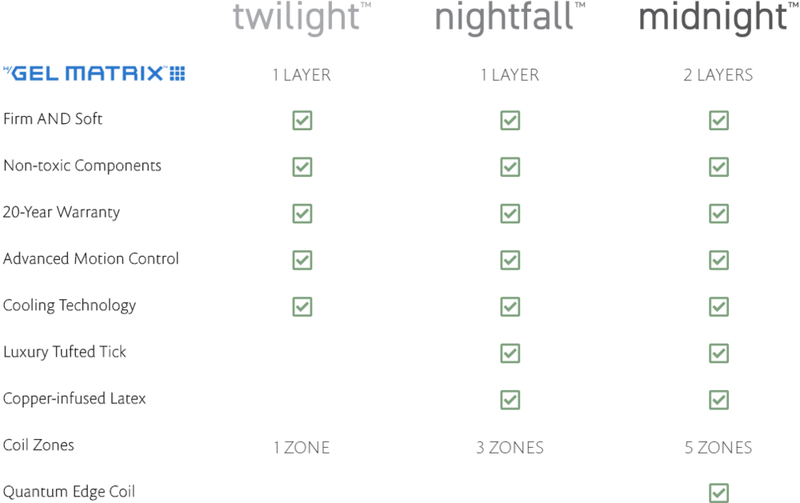 Click the links below to see more information about the Twilight, Nightfall, and Midnight INTELLIbed models. If you want optimal sleep, don't stop with just your mattress. With an adjustable base, you can fine tune your position to fit your exact needs and wants for even greater sleep health. And they work amazingly with INTELLIbeds! Learn more about Reverie Adjustable Bases. The most important thing about choosing a bed is discovering which one feels best to you. Come in for you own personalized appointment to try out these incredible, sleep-changing INTELLIbeds today. I am 65 years old and I purchased an INTELLIbed from SleepWellness two months ago. It has been the best bed I have ever slept on. It does reduce pain spots I have dealt with for a long time. The adjustable frame and massage was well worth the added expense. How does INTELLIbed make the difference for you? Sleep is an anabolic state. What that means is that while our waking ours tear and break us down (catabolic), the time we spend in proper sleep actually regenerates and rebuilds our bodies, and especially our brains. Investing in an INTELLIbed is a way to invest in the kind of restorative sleep we need to live healthy. Waking up rested, and leaving behind the aches and pains of the old mattress sounds good, right? A full, restful night’s sleep will work wonders on your overall health and wellness, and INTELLIbed can help you get there. Comfort and relief from pressure points helps you ease into restorative sleep sooner, and stay in it longer. Proper spinal alignment throughout the night, decreasing joint and muscle soreness you might be feeling in your current mattress. Better overall health because of better sleep. One of the biggest issues for consumers in the mattress industry is longevity. So often, someone buys a mattress, and at first, they love it. Then after a year or two, they say that it just doesn’t feel the same. Often, it’s an issue of wear-down that means a loss of support. On the flipside, the INTELLIbed Gel Matrix is one of the longest-lasting materials we have ever found in a mattress. What it means is that your bed will feel amazing when you buy it, but it will also feel amazing in 2 years, 5 years, 10 years, and beyond! The 20-year INTELLIbed warranty is one of the best on the market, which means that this is one of the best mattress investments you can make. Take a look at this INTELLIbed durability study. CLICK HERE. The right sleep solution shouldn’t start to break down within a few years of buying it. You want your bed investment to last as long as possible to optimize the money you spend. An INTELLIbed mattress is worth every penny of that investment. The proof of longevity is in the materials of the mattress. The INTELLIbed Gel Matrix is made to go the distance without breaking down, so you get the support and comfort you need for a long, long time. We’ve all been there. We don’t want another night on the old mattress, and it’s time to bite the bullet and get a new one. You travel around from store to store trying to pick your new purchase out of the sea of options, while a salesperson hovers over you at every step. Come try a completely different bed buying experience here at SleepWellness. Our values are centered on helping answer your questions and educating you on how you can sleep better. Time and again, our clients thank us for not being salesy or pushy. That’s not what we’re about. We’ll be real, honest, and helpful in walking you through your purchase. Avoid the headache of traveling around to find a bed, and avoid working with pesky salespeople. Have the peace of mind that comes from working directly with one of us (the owners) at SleepWellness to answer your questions and walk you through the purchasing process. We’re local, which means you’ll be helping grow the economy here in Heber Valley. Start sleeping better and living better now! Call or click below to set up your own personalized appointment with us to come in and find your new INTELLIbed today.